Currently GM of David Chang's ambitious restaurant Momofuku Ko, Su Wong Ruiz helms a team of some of the most experienced, creative spirits in NYC. They just so happen to be super talented chefs, servers and beverage pros. 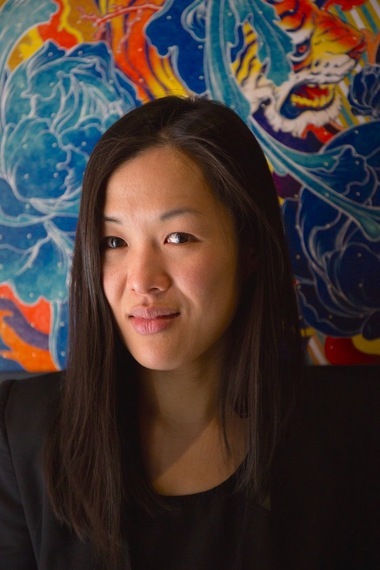 Currently GM of David Chang's ambitious restaurant Momofuku Ko, Su Wong Ruiz helms a team of some of the most experienced, creative spirits in NYC. They just so happen to be super talented chefs, servers and beverage pros. Most nights, she can be found warmly welcoming guests as they tuck into an unassuming entrance off a little known East Village side street, beginning an ultra-elegant, 15-course, two-and-a-half-hour dining experience they'll likely never forget. Su Wong Ruiz, General Manager of Momofuku Ko, NYC. Photo by Brendan Newell. We talked with her about the company's team culture, what it means to be nourished and her spicy chip addiction. How did you come to be involved in the restaurant business? Out of culinary desperation, really. After college, I was in a small town in New Mexico called Taos. I love New Mexican food but there was little else available. I needed more variety so I started cooking a lot. I really enjoyed it and thought, "Maybe I should make a career out of this." I somehow conned my way into being a breakfast cook at a really busy local cafe. After that I conned my way into the best restaurant in the town -- which had gotten the FOOD & WINE Best New Chef Award -- and the chef ended up opening doors for me in New York. So that was sort of the start of the restaurant business for me. Why did you decide to transition from cooking to management? Out of necessity. I wasn't seeing my husband at all, and even though management is still very demanding, it gives me a little bit more leeway. No one is as stressed out or works as hard as a chef, except maybe a new mom or an air traffic controller. Compared to other places you've worked, what makes the momofuku team unique? Ultimately it's culture. Dave [Chang] is very much the center of the culture, the spirit of the culture. Even though he's doing a lot of things, he's still so involved in everything. I think of it like Apple -- which is so synonymous with Steve Jobs -- and it's just always innovating, always being dissatisfied. It's the truth. Our DNA is just to question everything -- how do we make it better, not be satisfied with the status quo. But also, the company hires really intelligent and dynamic people -- more than any other place I've ever worked. They challenge each other. They work really hard and are super fun, super crazy. I think that dynamic makes it a really interesting and challenging place to work. It's never boring. Other places tend to make formulas of things and at Momofuku it's like, "What got us here won't get us there." So it's always just questioning. And I like that. I like being challenged. 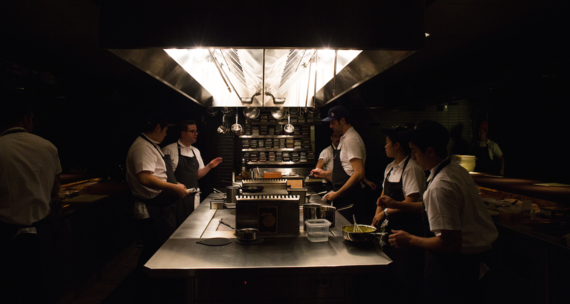 Momofuku Ko's open kitchen. Photo provided by Momofuku Ko. I've been called a tiger mom [laughs]. I don't know if I like that. I think of myself like a mom -- I don't have any kids, but I have all these kids running around the restaurant. I love them dearly. They're like family to me. We all really like each other, which is strange [laughs]. My style? I like to encourage each person to find the best version of themselves. I challenge myself to be the best version of myself, not to be static. So, if somebody's really talented at creative aspects or if somebody's really strong with numbers or facts, you want them to work on that, to piece together everybody's strength. To sort of create this restaurant super-being, it's just identifying the strengths and trying to piece all that together. As far as dining at Momofuku Ko, what experience do you hope guests walk away with? On the ultimate level, what we strive for is to make people feel: "That was the best meal of my life. That was the best experience of my life." And that's the ultimate; that's what we strive for everyday. But that high -- as Dave says: "Perfection is perfectly unattainable." So, we can only strive towards that. But that's what I'd like to hear, and often we do hear that. Even if we fall short, we want you to leave feeling like you've been nourished, that people cared about the food that was put in front of you, that the servers cared about you genuinely, that the entire experience was one that was caring, warm, nourishing, genuine -- at the very least. What's your favorite dish on the tasting menu? I really love the razor clam, and it's a dish that -- besides being tasty -- is indicative of how the chefs create a dish and improve on a dish. Razor clam dish at Momofuku Ko, Photo by Gabriele Stabile. 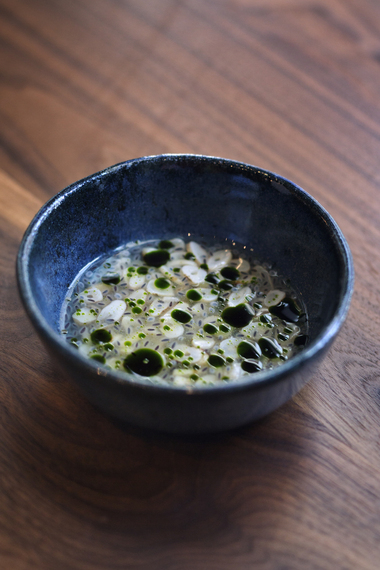 The pineapple dashi component has been a part of their repertoire for a long time, and that has its roots in Dave's culinary education when he was at Cafe Boulud. It just adds such a history to the dish. So you know he was creating an amuse bouche, and he created this scallop dish. At the time, Andrew Carmellini was the chef there and said, "Why don't you add pineapple?" It sounded like a bad fusion dish, but it worked. And then Dave took that, and turned it into a pineapple dashi. They were initially doing this dish with scallops, then someone had the idea of doing it with razor clams. And then somebody had the idea of charring the razor clams to add smokiness to it. So it just kept evolving and just becoming more delicious. I think that dish has so many facets to it. It's deceptively simple when you look at it, but there's such a background to it. So I think that dish is very reflective of the philosophy of Ko and all the people who've worked on it -- including Dave. I eat enough for an army late night, as I don't eat during the day because of service. I married well, and my husband looks after me very well. He usually orders something for me, so I always have this surprise waiting for me at home. My favorite is when he orders from Sushi of Gari. It's awesome when that happens. It's like, "Oh wow, bonus!" Pristine sushi waiting for me at 2am -- so awesome. Doritos. And one of my guys just introduced me to super spicy...what're they called? Flamin' Hot Cheetos! I just discovered them. They're evil [laughs]. He brought a bag in, and we just opened them to have a couple. Half the bag disappeared in like, no time. For more great food & lifestyle content, visit the Reserve blog and follow us on Twitter, Facebook and Instagram.